In the hills that make up The South Downs, just behind Hangleton and Mile Oak, there is a valley known as Devil’s Dyke. It is unclear whether this long, deep hollow (or Dyke) was created as the result of glacial action during the ice age or if it is a river valley. Whatever had originally caused it, Devil’s Dyke is, and has always been, an incredibly popular local attraction. It is thought that it gained its name from a local Sussex legend, in which the Devil supposedly excavated a ditch from the sea, through the hills of the South Downs, through to the Weald (the large flat plains beyond the hills) in an attempt to flood them, as there were a great many churches in the Weald. Luckily he was seen by an old woman who looked through her cottage window by the light of a lantern. Thinking that this light was the first sign of sunrise and sunlight being something of a hindrance to the Powers of Darkness, he threw down his tools in haste and high dudgeon and fled back to the underworld. This begs the question of why he didn’t return to finish the job, but the name seems to have stuck and it could be that the legend has played a significant part in the site’s popularity and doubtless added an air of mystery and romance to the place. Devil’s Dyke became a very popular tourist destination for Victorian and Edwardian day trippers, the area which the Devil didn’t manage to excavate offering magnificent views over the Weald, The Downs and The Sea. In the early years of the Dyke’s popularity, there were excursions up to the Dyke by horse drawn carts, but these were slow and often expensive. A round trip by waggonette from Brighton took around 3 hours; an hour there, an hour back and a frantic hour in between trying to see everything! There was clearly an opportunity for a railway to be built in order to improve travel to the Dyke. The reasons for this were cited as being primarily for excursion traffic, but also when the possibility of housing development around the summit was realised. As a result, the Brighton and Dyke Railway Company was formed. It was envisaged by the railway company that an estimated annual traffic of some 273 thousand people would visit the site and that there would be at least 10 thousand visitors on Bank Holidays. On 2nd August 1877, permission was granted to construct the line and integrate its workings with the South Coast Main Line from Brighton through to Shoreham and Worthing and beyond. 10 years later on 1st September 1887, the line was opened. It ran from a junction with the South Coast Main Line, roughly adjacent to Aldrington Halt in the present day (at the top of Tamworth Road) and terminated 3½ miles away in a roughly north-westerly direction. Because of its location high in the hills of the South Downs, the line inclined for the whole of its length and climbed by some 400 feet over a ruling gradient of 1 in 40. The one really daft thing about the Dyke Branch line and (I suspect) what may have ultimately led to the decline in the line’s popularity, was the fact that the railway ended ½ mile from the Dyke proper and in this ½ mile, patrons still had to climb 200ft in order to reach the vantage point. It is hard to tell if this affected the popularity of the site in its early years. On the one hand the site was very popular with holiday makers, but there was never the anticipated flurry of development despite the obvious advantages of rail access. No residences were ever built at the vantage point with the exception of the hotel. However, a number of tourist attractions were built around the site throughout the Dyke’s popularity: a funfair was built, a switchback railway, a funicular railway was constructed on the slope facing the Weald and a cable car railway was built spanning the trench. Also, at some stage of the proceedings, a replica of King Tutankhamen’s tomb was built in the southern side of the trench. In the same way that the Kemp Town Railway was originally built with no intermediate stopping places along the bulk of its length after London Road Station, the Dyke Branch had no stopping places on its route until the creation of Rowan Halt, which was began on 18th December 1933 and completed 12th January 1934, quite late in the Railway’s relatively short life. 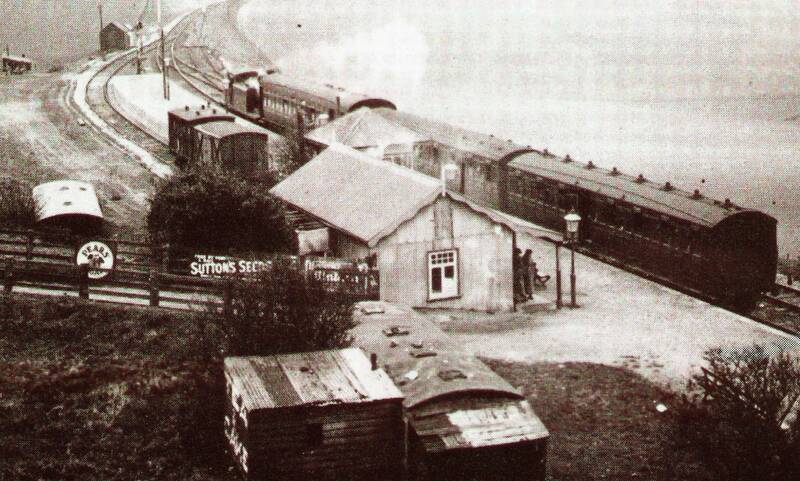 Rowan Halt was roughly half a mile from the Branch’s junction with the South Coast Line at Aldrington, situated on the Knoll Estate in Hangleton, between Rowan Avenue (from which the name originates) and Stapley Road. At around the same time, a private “hail and ride” halt was built ¾ mile (roughly 62 chains) from the Dyke Terminus to serve a new golf club nearby. It is interesting to note that after the opening of Rowan Halt, all winter services terminated there, as the only real traffic at that time of year was concerned with the construction of a rapidly developing housing estate in the area around the halt. The line was served from Brighton Station, with trains serving Holland Road, Hove, the newly built Dyke Junction Halt (later Aldrington Station) and Rowan Halt. The line was originally worked by “E4” class 0-6-2 tank locomotives and later by Sentinel Steam Railcars and “Marsh” Motor Sets. Luckily there was a shunting loop at Dyke Halt so that a loco could run round a train and return to Brighton ‘bunker first’. It is sad to note that by 1932, most people had forsaken the poor railway in favour of cars and buses and this was really deemed the beginning of the end. For some time the powers that be had viewed the Dyke Branch as little more than “an expensive line, little more than a glorified mountain railway, with rapidly diminishing traffic prospects”. The line closed on New Year’s Eve 1938, amid much sadness and melancholia.